Zenyatta’s new skin portrays him as Tang Sanzang from the Chinese novel Journey to the West. Sanzang is actually the central character of the novel, which is about the Buddhist monk’s pilgrimage to obtain religious texts. 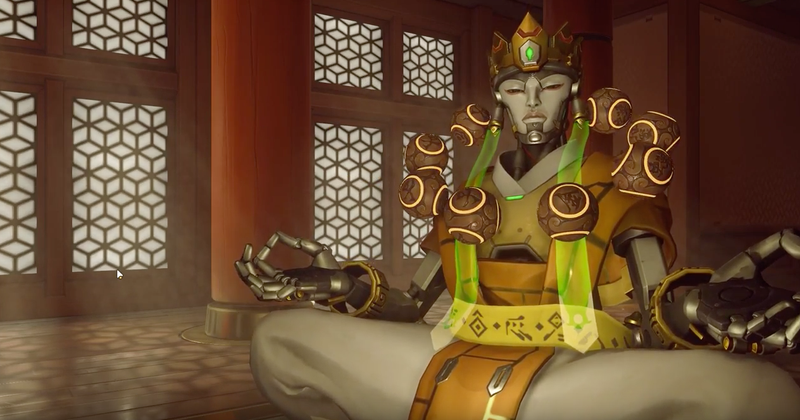 All that is really fascinating, but the Sanzang skin also gives Zenyatta chiseled cheekbones and luscious lips. Zenyatta is hot. I’m so sorry for doubting this before. For a lot of players this comes as a surprise. Some are comparing him to Handsome Squidward from Spongebob Squarepants. I’m also really glad that I just got to part 3 of JoJo’s Bizarre Adventure last night so I understand these jokes. To everyone having a crisis over Zenyatta’s face: I love and understand you. But the best thing about fandom liking something a bunch is really good fanart. The fanart of the Sanzang skin has been phenomenal. Truly, we are blessed.